Sunset light gathers on the Wingate Sandstone of Hatch Point above Indian Creek. This feature is on the route to The Needles District at Canyonlands National Park, Utah. Your host drives on U.S. 550 in New Mexico. I had a nice breakfast with Abby, a tradition of ours, then hit the road. I only stopped to shoot a few items. I talked to some good friends on the phone, listened to satellite radio, and called Abby at least half a dozen times. 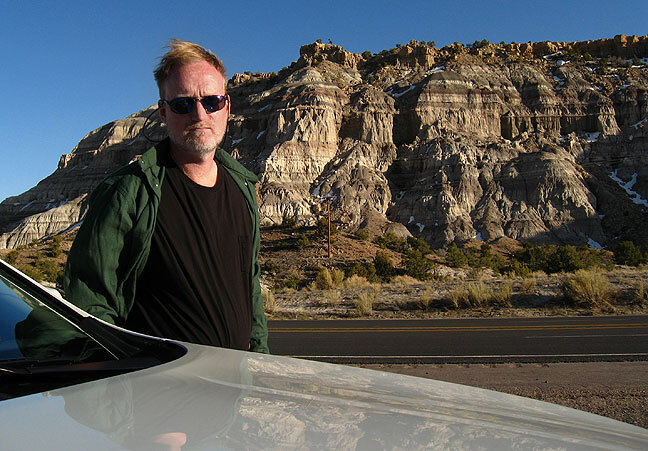 Your host poses at a badlands outcropping U. S. 550 in northwest New Mexico. This feature crosses U.S. 550 north of Cuba. I repeatedly told myself the “next time” i saw it I would photograph it, and this was that time. 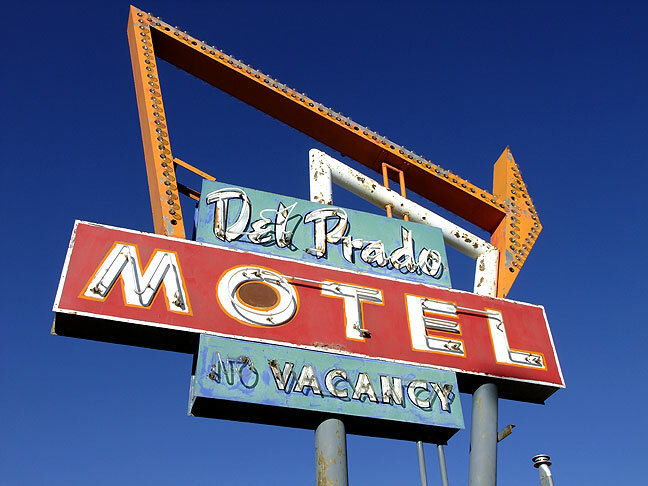 A hotel sign is set against a brilliant blue sky in Cuba, New Mexico. Coffee always tastes different on the road, and the first sip always brings a pristine rush of memory, the taste of adventure ahead. I arrived after dark in Monticello. I was initially hesitant about the day early because of rain and high wind in the forecast. For much of the day, the sustained wind was over 40mph. 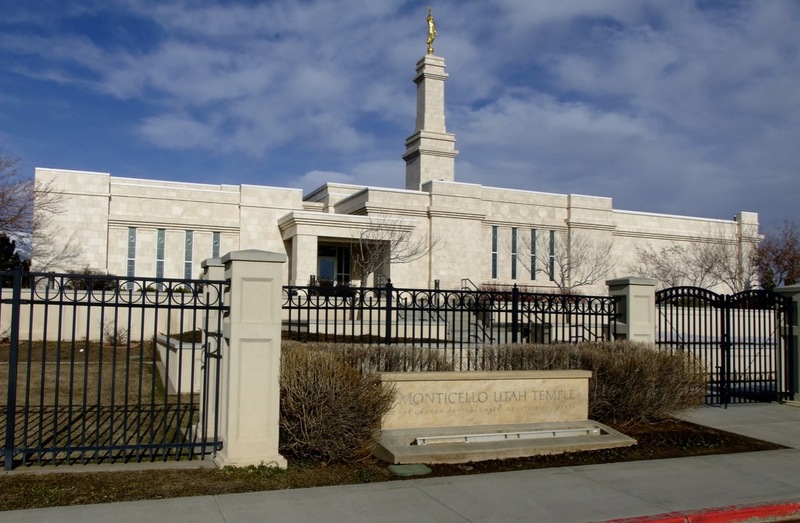 I photographed Monticello’s Mormon Temple for my Mormon friends. I photographed the Mormon Temple in Monticello both due to its handsome architecture and the fact that I have several close Mormon friends. 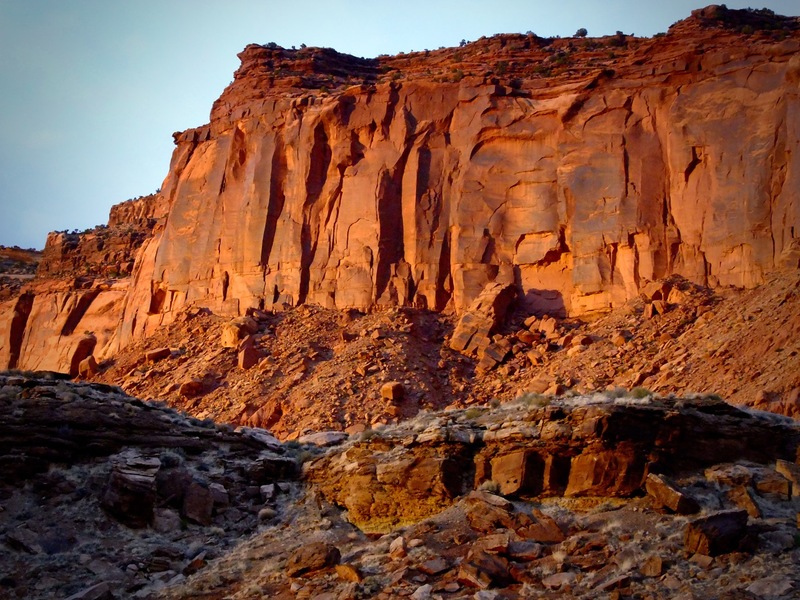 Your host hikes on the Chesler Park trail at Canyonlands. I made my way up the Hart’s Draw road west of Monticello only to discover it was closed at the first campground due to heavy snow. Someone later told me Monticello had about 200% of their normal snowfall for the winter of 2010. I drove to Elephant Canyon and hiked the Chesler Park/Devil’s Pocket loop trail for a total of about 8.1 miles in a little less than six hours. The actual Devil’s Pocket loop is pretty rugged, and I didn’t see anyone else on it. Backpackers pass “The Wall” on the Chesler Park trail at Canyonlands National Park, Utah. This layered sandstone crack leads down into Elephant Canyon. Ascending the other side of Elephant Canyon; this portion of the trail is steep enough to utilize a few switchbacks. 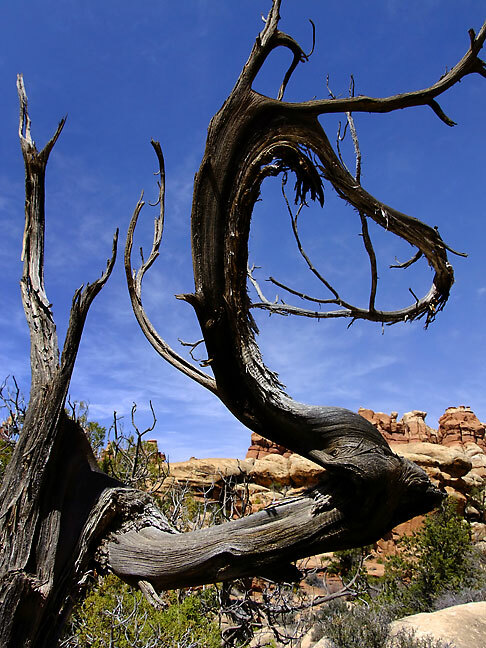 A long-dead tree branch frames pinnacles for which the Needles District is named. This ended up being one of my favorite images from this trip. 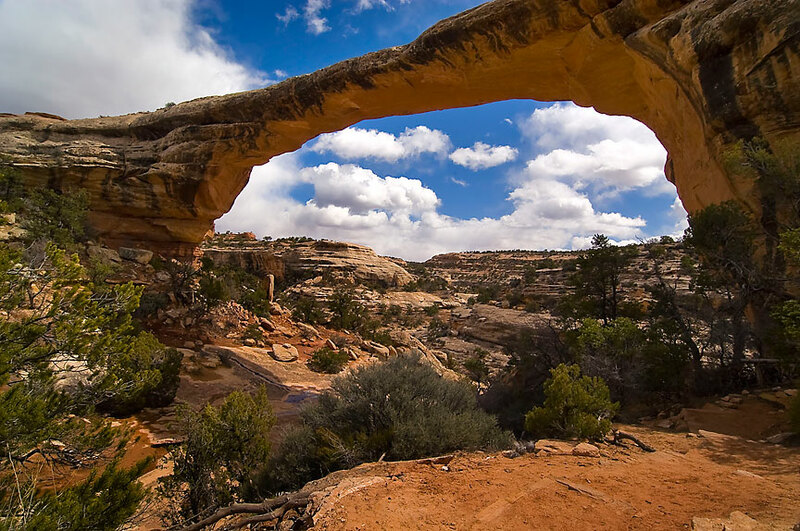 Part of the adventure in a place like Canyonlands is the playground-like landscape, which begs to be explored. The Devil’s Pocket trail passes through several cracks like this, which take on an almost cave-like appearance. View from the edge of a side-canyon. At the very north end of the Devil’s Pocket loop, the trail takes a left turn into the heart of the Needles formations, past this impressive piece, then down into the Pocket itself. The trail bends southwest beneath this enormous mushroom rock. The trail passes a backcountry campground, then follows the Devil’s Pocket itself, which is a long, narrow flat, seen in this view looking back to the north. Looking forward as I continued my counter-clockwise journey on this trail, it was easy going through much of this empty, flat area. In the distance to the south are towering sandstone spires. A dramatic sample of “desert varnish” marks the overhang in the right side of this frame. The trail passes a large dead tree on the floor of the Pocket. This two-panel panograph shows the view from the top of the bench at the south end of the Devil’s Pocket, looking north. The trail is visible in the center of the frame. From that same spot looking south. The wind at the top of this bench was funneled into a constant, pounding, sandy gale. 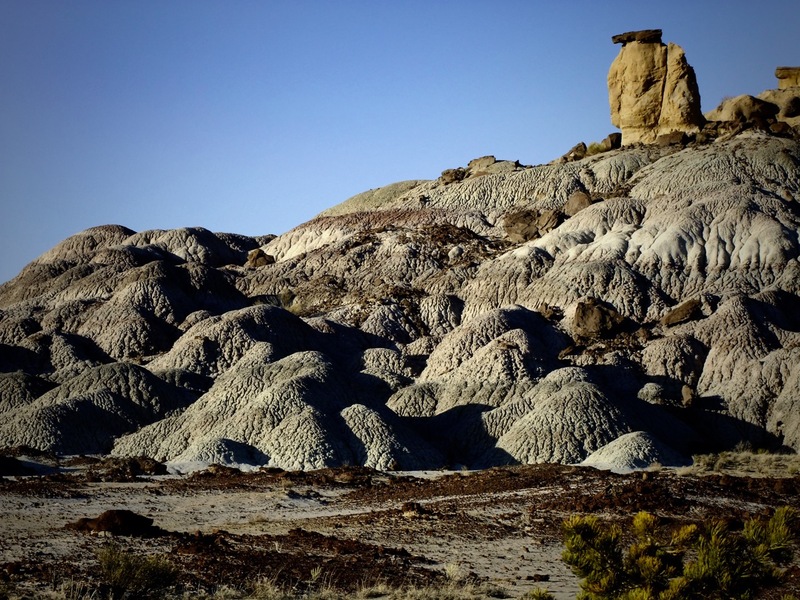 The trail climbs farther up as it turns east, leading past some of the tallest, most impressive hoodoos in the area. I would guess these to be 75 feet tall or more. In shadow, Cedar Mesa sandstone takes on a cool blueish hue. Back on the Chesler Park trail, moving toward Elephant Hill. Two-panel panograph of the view from the top of the bench near the intersection of the Chesler Park trail and the Devil’s Pocket trail; I’ve shot from this spot many times, and I regard it as the garden spot of the Needles District, and as one of the most amazing places in the world. A hauntingly beautiful dead, weathered tree stands on the trail. On passes and benches, the wind was funneled into ferocious gales. I came upon two friendly Park Service rangers who were on their way to examine some vandalism along the Chesler Park trail. For the first time since I have been hiking in the desert, I got back to the trail head with zero water. I had a blow-out coming out on the Elephant Hill access road, and I assume I struck a sharp rock or other obstacle. A nice couple of guys came from Sandstone Tire in Monticello and got me going after I discovered I didn’t have the key to unlock the wheel. 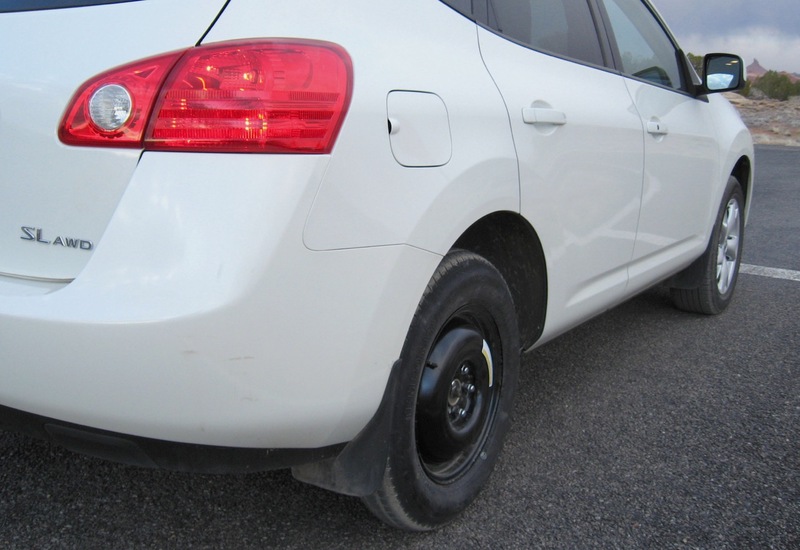 This is the temporary spare on my Nissan Rogue, placed there after a crew came from Monticello to chisel off the locking lug nut on the regular wheel, the key for which was misplaced by my tire shop. I was back in Monticello after dark. 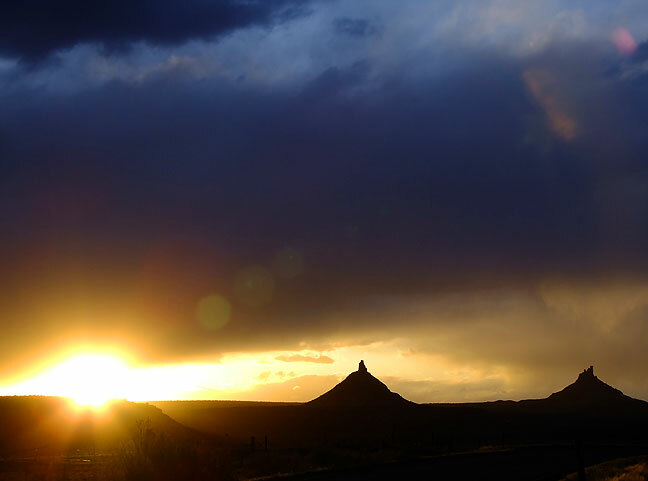 The sun sets behind South and North Sixshooter Peaks on the Indian Creek Scenic Byway. 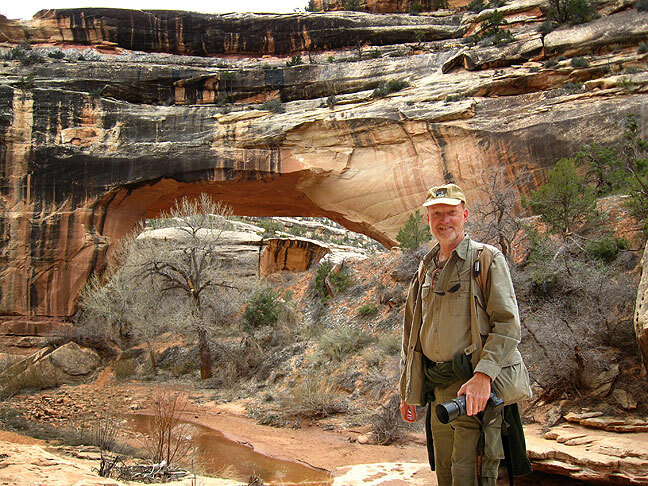 Abby and I hiked to the Sipapu Bridge at Natural Bridges on The High Road in 2003. On this trip I wanted to hiked down to the other two, Kachina Bridge and Owochomo Bridge. 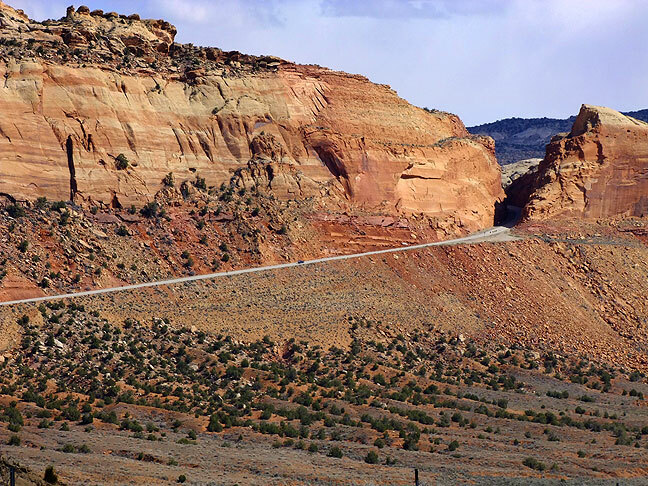 Utah state highway 95 crosses the Comb Ridge. THe author poses at Kachina Bridge after hiking much of the White Canyon trail; note my fleece tied around my waist, since it was cold in the morning but warmer when I returned. I had breakfast at PeaceTree Café on the north end of Monticello. I’d seen it on several other trips. It was one of the best breakfasts I have ever enjoyed on the road. 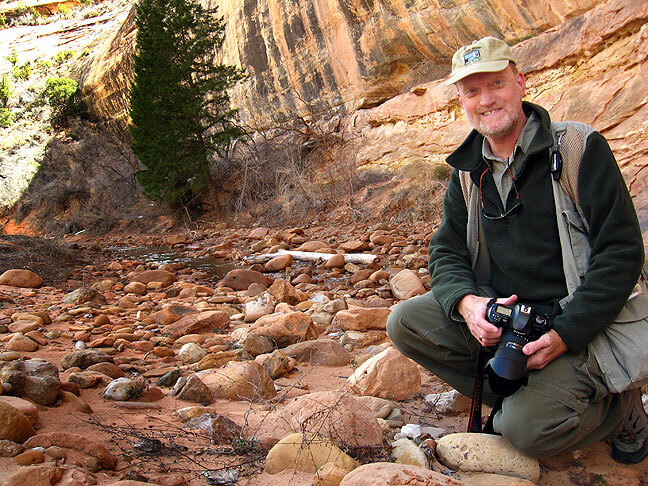 I was quite cold when I got up in Monticello, and not much warmer when I arrived at Natural Bridges National Monument. And again it was crazy windy, though only on exposed areas like cliff tops. Hiked down the steep but relatively short trail in White Canyon to Kachina Bridge. I found the bridge itself to be larger and more impressive than I had imagined it would be. I continued up White Canyon for several miles exploring and hunting for native ruins, which I found but did not photograph. I hiked back up to the trail head and drove to the Owachomo trial head. A different option if I had more time would be to hike the canyon between the two, which is about three miles. The trail down to Owachomo Bridge is short and easy. I made some decent images despite somewhat subdued light. The Bridge itself is fairly impressive. The obvious temptation is to climb on top of it, but this must have become a problem because signs say it is expressly forbidden. At the bottom of White Canyon in Natural Bridges National Monument is the impressive Kachina Natural Bridge. View from directly under the Bridge, showing hikers for scale. Kachina Bridge from the other side after walking through the opening. Owachomo Bridge viewed from below after hiking down through the opening; note water flowing on right side of the frame, a qualifier for this formation to be called a natural bridge. This is the classic view of Owachomo Bridge, viewed from the approach. Climbing on the span is expressly forbidden. 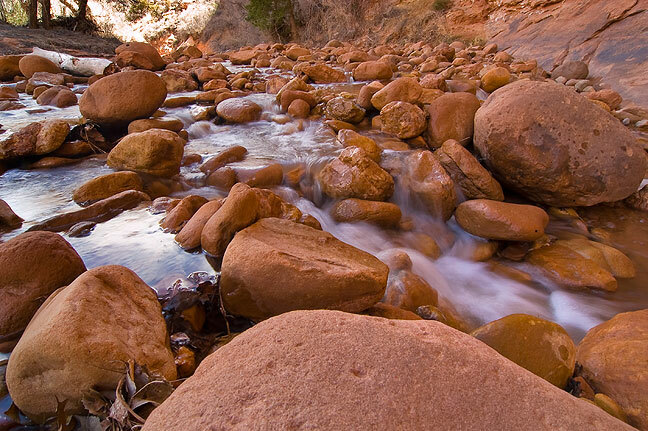 A mile or two up White Canyon, I found this wide spot in the stream where water flowed noisily through a stone field. 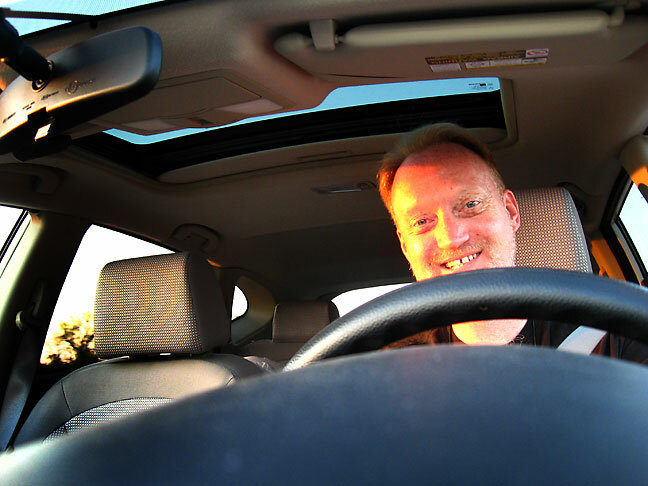 I drove home with some sense of urgency due to a crisis with Abby’s father becoming critically ill. I didn’t stop much and only shot one photo. Despite rapidly turning around from Utah, I was able to make a couple of excellent hikes, and I had a good time in the wild. 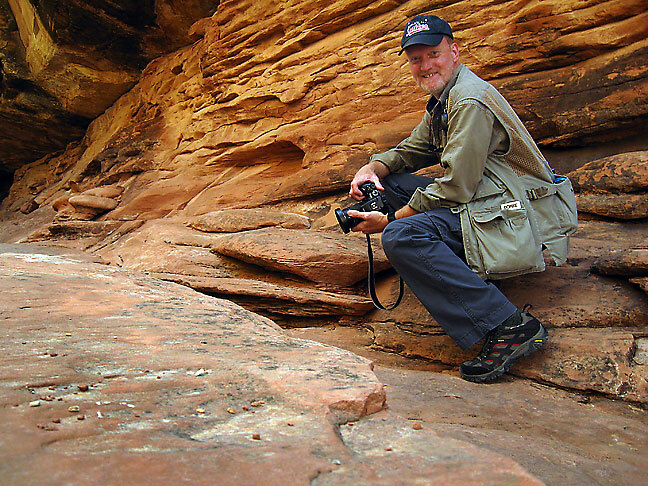 I smile for my wife Abby as I hike White Canyon; even when she can’t be with me, she is with me.